So – like everyone else this week – I’ve been prepping for Thanksgiving, trying to make as many things ahead of time as possible. And *shock horror* I’ve started thinking ahead to the Holidays too. So far, I’ve got the base for the Turkey Gravy, 3 different appetizers, and 2 different pie crusts in the freezer . 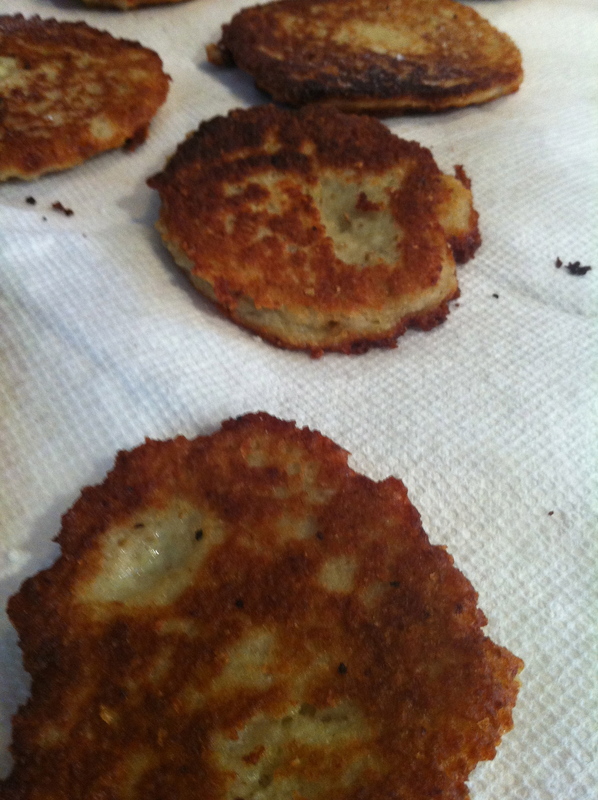 Today’s Projects were the Make Ahead Green Bean Casserole, and my father’s Latkes (fried potato pancakes). I made the green bean casserole with only *1* substitution!! I swapped out the 1 1/2 cup cream (since it’ll be served with a Meat meal, the recipe needed some swaps) for 1 cup unsweetened soy milk and 8oz (1 tub) of non-dairy cream cheese to give it that creamy taste. I really like the Tofutti brand. I had C shove the covered dish in the freezer, so next week I’ll tell you what the end result was. After much discussion with my Mother-in-Law, I decided to try making latkes ahead of time, freezing them, then re-heating for our Holiday party next month. This is the test run to see how they’ll hold up. Again, I’ll have to get back to you on that one. 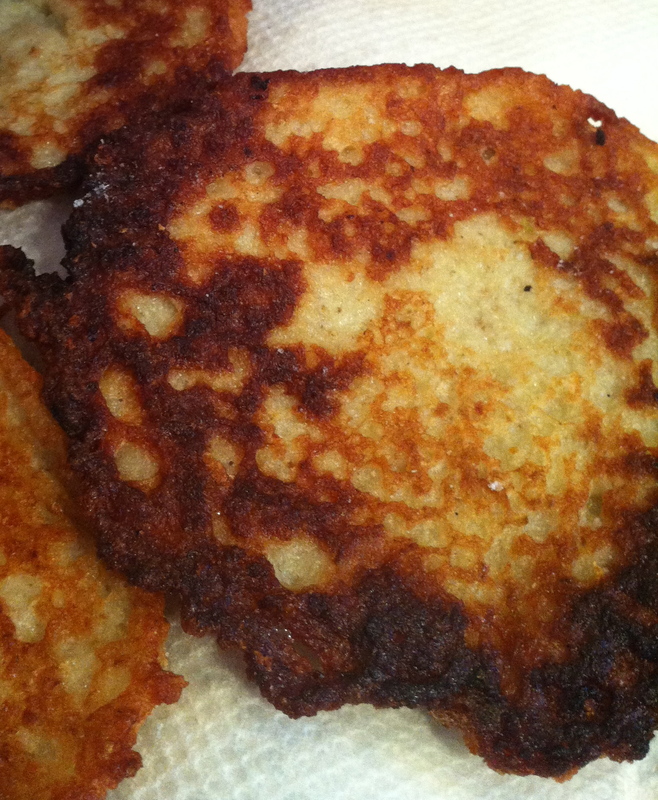 The latkes are super-duper easy, but wow they’re not light in calories. I think I’ll be starting my workout program now…. Make Ahead Green Bean Casserole from MelsKitchenCafe.com, who adapted it from Cook’s Country! 1- For the topping: Pulse bread, butter, and salt in food processor until coarsely ground. 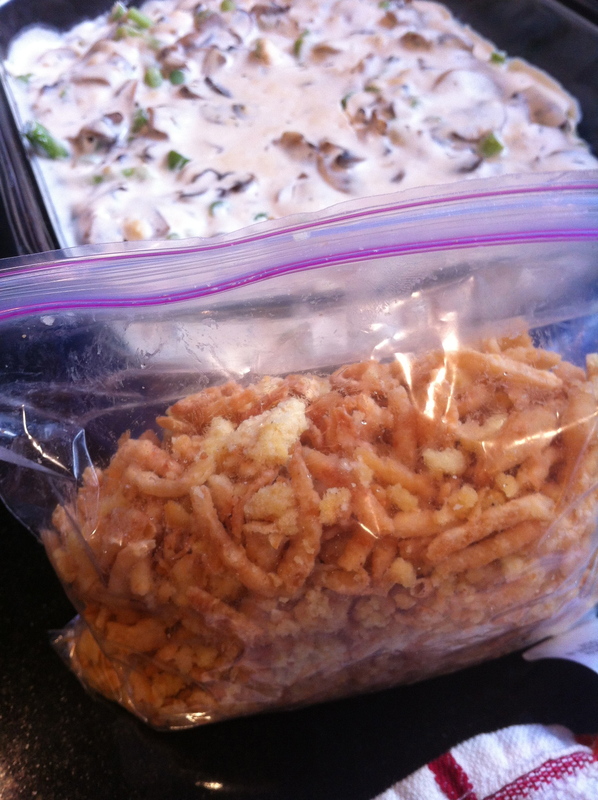 Combine bread mixture and canned fried onions in a bowl, transfer to a zipper-lock freezer bag, and freeze. (I placed the topping bag right on top of the casserole in the freezer so I could keep track of both. )**I did this too, but added the printed recipe to the pile so I’ll have it on hand when I pull it back outta the freezer. 2- For the casserole: Melt the butter in a large 12-inch skillet over medium heat. 3- Add the mushrooms, salt, and pepper and cook until the mushrooms release their liquid, about 5 minutes. 4- Increase the heat to medium-high and cook until all the liquid has evaporated, about 5 minutes. 5- Add the garlic and thyme and cook until fragrant, about 30 seconds. 6- Stir in the flour and cook until golden, stirring, about 1 minute. 7- Slowly whisk in broth and cream (**or Soymilk & Tofutti!) and bring the mixture to a boil. Reduce the heat to medium and simmer, stirring occasionally, until the sauce has thickened, about 10 minutes. **Since the recipe doesn’t describe just how thick ‘thickened’ should be, I channeled the Campbell’s Soup God’s and waited til it looked and tasted as thick as a can of Cream of Mushroom soup. NOT as thick as when it’s first outta the can, no no – when you’ve added the milk. That’s how thick I let it get. That make sense? 8- In a large bowl, toss the green beans with the cornstarch until the beans are evenly coated. 9- Transfer the beans to a 9X13-inch baking dish. 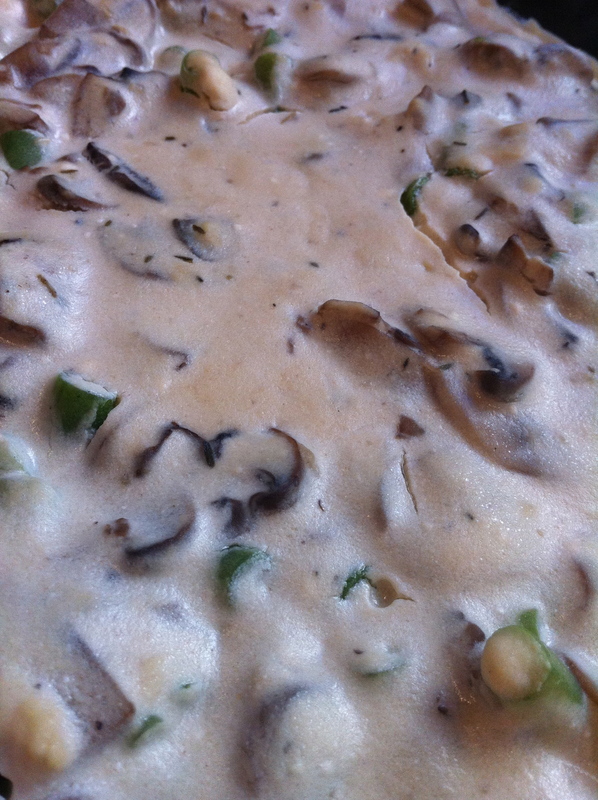 Pour the warm mushroom mixture evenly over the beans. Let the casserole cool completely on the counter. Once cooled, cover with a layer of plastic wrap and then a layer of foil. Freeze for up to 2 months. 10- When ready to bake, adjust oven rack to the middle position and heat the oven to 400 degrees. Remove the layer of plastic wrap from the baking dish and replace the foil. Bake, covered, until the sauce is bubbling and the beans are tender, about 80 minutes, stirring the beans thoroughly after 50 minutes. Remove the foil and spread the frozen topping mixture over the beans. Bake until golden brown, about 8-10 minutes. Serve. Crispy edged fried potatoes? How can you NOT wanna stuff your face? 1- Heat oil in a heavy pan (I used my cast iron skillet) over a medium heat. 2- In the Food Processor or a Blender, pulse the eggs then add everything else. Blend away! 3- Pour/scoop 1/2 cup of batter into the oil and fry. If you like smaller pancakes, use less batter! You will need to flip the pancakes when you can see the edges getting dark goldeny brown, 2-3 minutes per side. You will also need to keep adding oil as these puppies suckin the oil! 4- Drain latkes on paper towels. 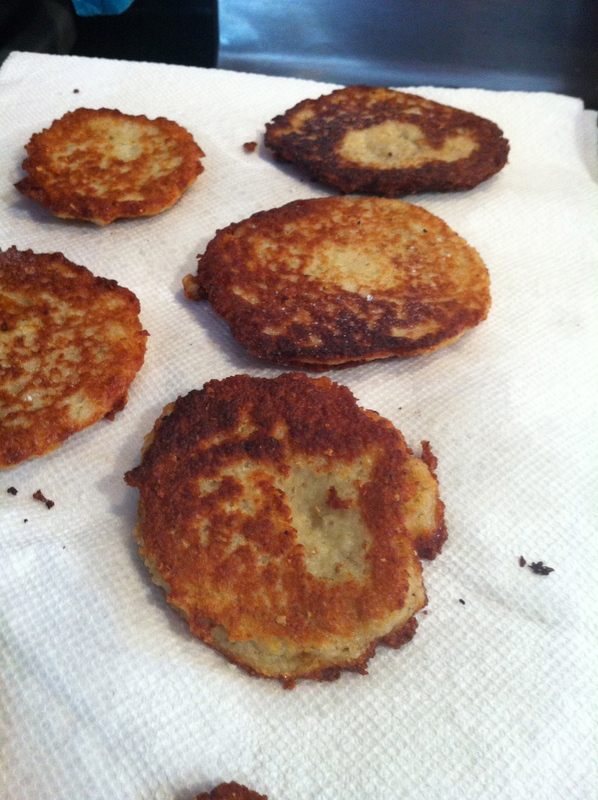 Our family friend George used to heat the oven on 200, lay his latkes out on a baking sheet in layers separated by paper towels, and let them sit all day long. They got amazingly crispy and delicious. …I can feel my thighs expanding as I write this. ** OH! Lightly salt the latkes while they are draining on the paper towels. It will make all the difference.